Exactly who published this directory isn’t clear. Here is the entry for Eversholt. Transcription, and mistakes, by Emrys Williams. 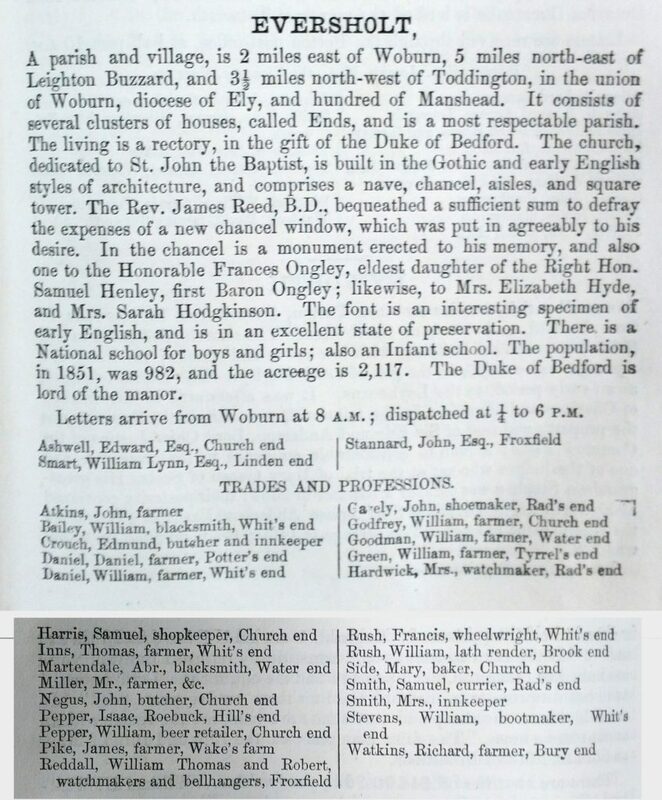 A parish and village, is 2 miles east of Woburn, 5 miles north-east of Leighton Buzzard, and 3½ miles north-west of Toddington, in the union of Woburn, diocese of Ely, and hundred of Manshead. It consists of several clusters of houses, called Ends, and is a most respectable parish. The living is a rectory, in the gift of the Duke of Bedford. The church, dedicated to St John the Baptist, is built in the Gothic and early English styles of architecture, and comprises a nave, chancel, aisles, and square tower. The Rev. James Reed, BD, bequeathed a sufficient sum to defray the expenses of a new chancel window, which was put in agreeably to his desire. In the chancel is a monument erected to his memory, and also one to the Honourable Frances Ongley, eldest daughter of the right Hon. Samuel Henley, first Baron Ongley; likewise, to Mrs Elizabeth Hyde, and Mrs Sarah Hodgkinson. The font is an interesting specimen of early English, and is in an excellent state of preservation. There is a National school for boys and girls; also an Infant school. The population, in 1851, was 982, and the acreage is 2117. The Duke of Bedford is Lord of the Manor. Letters arrived from Woburn at 8 AM; dispatched at a ¼ to 6 PM.